Although SGA recommends primarily using organic material such as compost and manures to promote fertility, it’s worth thinking in more detail about plant nutrients. We know plants need them, we know things go wrong without them, we know gardening gurus can’t stop talking about them, and we know certain combinations of them can cost us a mint at the garden centre. But what do they do, and what on earth are we paying for? Here is a list of plant nutrients, and why they are so important. Nitrogen is a vitally important element in the plant amino acids (the building blocks of proteins). It is also a necessary part of the green bits in the leaves of plants (chlorophyll) and really important for leaf growth. Plants may be nitrogen deficient if older leaves are pale green to yellow often with a tinge of red of plants are stunted. Nitrogen deficiency may be a cause of leaf drop. Plants may have too much nitrogen if shoots wilt, dead spots appear on the leaves of young plants or if masses of soft deep green leaves that are prone to pest and disease appear. 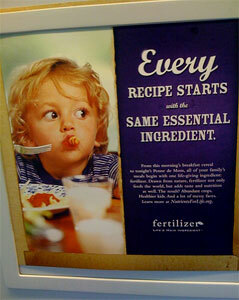 Phosphorus is involved in just about everything that goes on in plants. It is especially important where cells are actively dividing (growing), and it promotes the growth of seedlings, roots, flowering, and fruit and seed formation. Plants may be phosphorus deficient if they have poorly developed roots, are a bit stunted, and, most obviously, leaves have a purple tinge to them. Plants may have too much phosphorus if older leaves display necrosis (browning and death) of tips and margins followed by dropping off of the affected leaves. Chlorosis (yellowing) of younger foliage often occurs and the plant dies in severe cases. Phosphorus toxicity is rare in many species but there a small number of species that are most prone to the problem. Of these species the majority are Australian natives from the Proteaceae family. Potassium is extremely important in helping plants resist disease, producing chlorophyll, making plant cells stronger and moving water through plants. Plants may be potassium deficient if they have weak stems, older leaves are floppy and have brown scorched edges and can be bluish green, and may be overly sensitive to frost. If you live in an area with really sandy soils and a fair bit of rainfall, you may just come across this deficiency. Symptoms may also be similar to phosphorus deficiency, but with the added bonus of poor root development and wilting of new growth. Just as we need calcium for strong bones, plants need calcium for tough cells walls… very important in keeping plants looking like plants! Helps the growing areas of plants, like root tips, function as they should. Plants may have a calcium deficiency if you have highly acid soils and notice weak plant stems, and see stunting or dead spots on the newest leaves. Plant roots will often be stunted, brown and dead. Leaves of grasses and grass-like plants may fail to form properly, and appear rolled. Calcium is often present in soils in correct quantities, but, due to other factors (pH or other nutrient deficiencies) are not able to access and use this micronutrient. Plants may have too much calcium if they display signs of magnesium and boron deficiency. Rarely do plants have too much calcium, but, in highly acid soils, excessive calcium take up can make magnesium and boron unavailable to the plant. Important in photosynthesis, as magnesium makes up part of the chlorophyll molecule (the green pigment in plants). Australian soils generally have perfect levels of magnesium, unless they have been treated for a long long time with chook poo. The high potassium levels in poo can make magnesium unavailable to plants. Plants may be magnesium deficient if older leaves of the plant turn yellow while the veins remain green (this cool looking symptom is commonly referred to as “intervienal chlorosis” and is generally caused by an iron deficiency). Some plants, especially grasses, may have the edges of the leaves turned upwards, and, if the deficiency is severe, they may turn a reddish-brown colour. Although it’s unlikely this would happen, plants may have too much magnesium, but it would present first as a potassium deficiency. Sulphur is responsible for many of the flavours and odours of plants – think cabbage, Brussels sprouts and asparagus. Sulphur is also incredibly important in the production of chlorophyll and many plant proteins. Plants may be deficient in sulphur if newer leaves turn yellow, and new shoots are stunted. If left for ages, these symptoms will appear very similar to those of nitrogen deficiency, the difference being whether the yellowing appeared first in the new leaves (sulphur) or the older leaves (nitrogen). Plants may have too much sulphur if leaf size is reduced and overall growth stunted or newer leaves are yellowing or are scorched at edges. Older leaves may drop prematurely. Plants may not need too much of these guys, but they are required in micro amounts for healthy, happy plants. Generally speaking, soils with a high pH (alkaline soils) can cause these all important micronutrients to become unavailable, which means they are there in sufficient amounts in the soil, but the plants can’t grab them. Iron is an integral part of a number of plant compounds, specifically those that promote and monitor growth. Iron is also an important element in the chloroplasts (you know, the green bits!). 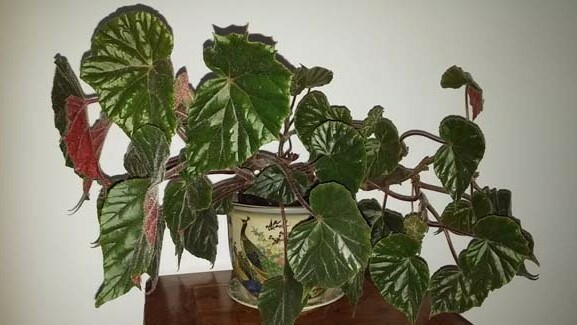 Plants may be iron deficient if young leaves of the plant turn yellow while the veins remain really green (this is commonly referred to as “intervienal chlorosis”). In severe deficiencies leaves will turn almost white. It’s pretty unusual, but plants may have too much iron as in potting mixes fed with additional iron chelates. Symptoms will appear as bronzed leaves with small, mottled brown spots, and is generally only seen on highly acidic soils or those soils lacking in silicon and somewhat water logged (rice fields often have iron toxicity issues). A bit like iron, manganese is important in the formation of plant proteins. 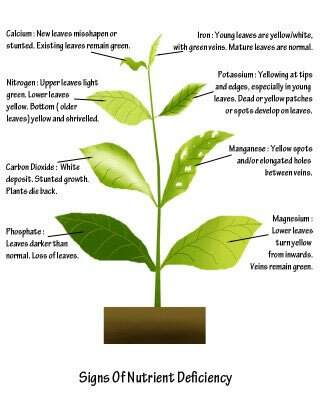 Plants may be manganese deficient if leaves towards the middle of the plant turn yellow while other leaves fade to a light green. Water soaked spots may appear across the leaves. Plants may have too much manganese if the edges of the middle and older leaves display brown spots with yellow rings. Crinkling and “cupping” of leaves can occur in severe situations. Boron is heavily involved in the formation of cells, and is super important to the growing tissues of young shoots, roots, flowers and fruit. Plants may be boron deficient if youngest leaves have yellow edges, growing tips blacken and die or leaves are crumpled and distorted. In some fruits and vegetables, boron deficiency can lead to a condition known as “brown heart” – a breakdown and corkiness of internal tissue. Plants may have too much boron if edges of the oldest leaves appear yellow, and then change to brown and black. This may look very similar to severe sun scorch. Molybdenum helps convert nitrogen gas present in the atmosphere into usable plant protein (very handy if you are a nitrogen-fixing plant). Molybdenum is also involved in the formation of proteins from nitrogen compounds, a complex way of saying it helps nitrogen move from the soil and become usable for the plant. Plants may be molybdenum deficient if the oldest leaves are mottled across the whole surface, stems are distorted or leaves start to turn in and become cupped. In cabbages, cauliflowers, broccoli and other members of the Brassiaca family, molybdenum deficiency can result in a disorder known as whiptail, where the main presentation will be narrow, distorted leaves. This is most likely to occur on highly acid soils. It is unlikely that plants have too much molybdenum since they are able to absorb molybdenum at far greater amounts than they actually require, without the plant displaying any toxicity symptoms. Critters that eat plants with extremely high levels of molybdenum may not be so lucky however, as high doses of molybdenum can result in copper deficiencies. Used in the production of plant enzymes it is an important factor in carbohydrate and protein metabolism. Plants may be copper deficient if the youngest leaves have dead areas on their growing tips, begin to yellow and are distorted. There is normally a huge decrease in flowering. Plants may have too much copper if growth is somewhat stunted. Copper toxicity displays symptoms similar to iron deficiency. Plants may be zinc deficient if the leaves of the plant are unusually small, young leaves bunch together or youngest leaves display yellow to white coloured mottling. Plants may have too much zinc if they have symptoms similar to iron deficiency. As with all things, nutrient issues are not always as they appear, and extreme care should be exercised when attempting to diagnose a nutrient deficiency. Many nutrient deficiencies display similar symptoms to those of environmental problems. For example, citrus in cool regions often turn yellow, but this does NOT indicate a nutrient deficiency. The new leaves produced when the weather warms will probably be a lush and healthy green. To complicate matters further, plant symptoms may also be indicative of herbicide damage where a non-target plant takes up damaging chemicals intended for, say, weed control. In home gardens, if soil is being enriched with compost and aged manures, nutrient deficiencies are not so likely. If a nutrient deficiency is suspected, the most important factor to determine is the pH of the soil or growing media. As soils become more acid or alkaline, available nutrients become locked and the addition of increased nutrients will not assist the situation. Don’t just feed your plants and hope to correct the issue… find out what the problem is first. You may kill them with kindness otherwise!